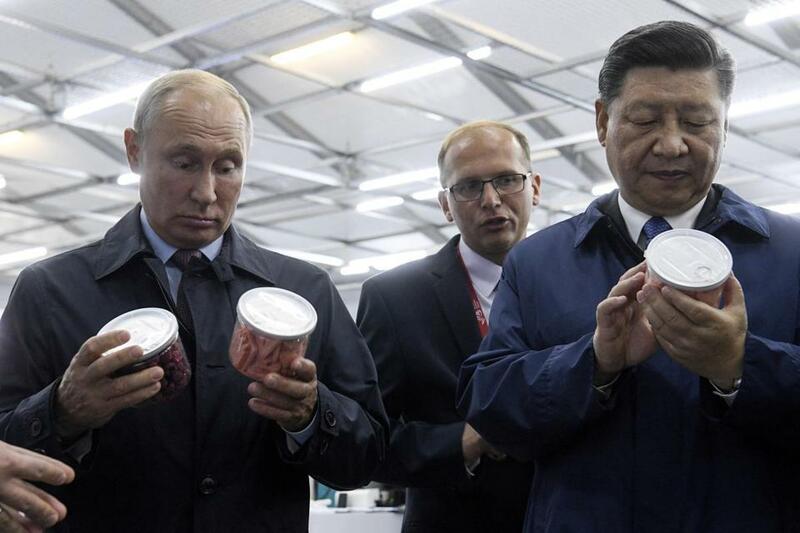 Russia’s Vladimir Putin and China’s Xi Jinping, key challengers to US power, visit a food expo in Vladivostok. Delegates from 195 countries are on their way to New York where the General Assembly of the United Nations will open its annual meeting this week. For three-quarters of a century, the UN has been a place where competing ideologies have squared off against each other. Capitalism battled communism. Nationalism shook off the vestiges of colonialism. And globalism began to encroach upon statism. This year, diplomats will arrive disoriented. The organizing philosophies of the last century have faded in the rearview mirror, unable to keep pace with changes in the political reality they seek to understand. These “isms” were devised in an earlier epoch, before technological advances enabled the rapid and inexpensive movement of people, capital, products, crime, and information on a planetary scale. The topics that animate political debate today cannot be properly understood by the “isms” of yesterday. This is true whether we’re discussing digital media’s challenges for privacy and opportunities for transparency, the militarization of local police departments, the long-term wisdom of clandestine drone strikes, or the effects of artificial intelligence and automation on American jobs. The old formulations for understanding how people and nations relate to each other are woefully inadequate to the ways in which the world works today. Instead, we need to articulate a new set of organizing principles that explain and describe the currents shaping what the president of the Council on Foreign Relations calls “a world in disarray.” New organizing concepts can help us understand the world in a way that can, in turn, help us put it back in order. 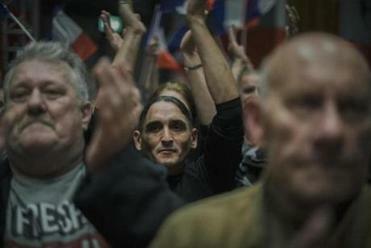 It is critical to look beyond a simple story of populism, of masses versus elites. Read: Is the US having a populist moment? Nowadays, political attitudes cluster in essentially two ways: either through a sense of shared history or a sense of a common future. Let’s call this stronger historical sense “pastoralism,” since it tends to idealize lineage. Others, whose political identity is propelled by a stronger sense of a common future, imagine a world where tribal divisions are conquered by the cultural exchange that trade and technologies facilitate. This might be called “productivism.” The term is already used in some corners of academia to describe human progress in terms of economic and technological change. But the term can be used to understand the worldview of globalization itself. For pastoralism, technological change is seen less as an extension of our humanity than a potential subversion of it. After all, people whose identity is wrapped up in certain traditions are liable to be anxious about disruptions to those traditions. This is an existential insecurity. The term “Luddite” is lately being used to describe those who resist technological change out of fear of the future. But Ned Ludd, the apocryphal textile worker for whom the “Luddite” movement was named two centuries ago, did not protest new technology itself. He tried to get a new technology — a type of knitting machine, in his case — to be run by skilled craftspeople paid a respectable wage. The Luddites wanted to preserve a kind of craftsmanship undermined and undervalued by the exuberance for new advances in machine knitting. Protection and reverence for this kind of craftsmanship in the face of industrial change would find expression in the French “artisinat” and German “handwerk” movements. Ned Ludd would have been happy to see how pastoralism in our own century has revived a culture of artisanship. This is seen in the slow-food movement, the renewed popularity of vinyl records, and pour-over coffee. Looking at American culture through the lens of pastoralism, we can see how a liberal Brooklyn hipster and a conservative Kentucky coal miner might identify with each other. Both make claims to a way of life and a sense of their own humanity that, they feel, is imperiled by the march of economic and technological “progress.” The hipster’s condemnation of the commodification of popular culture shares a kind of spiritual fervor with the miner’s condemnation of the climate change “hoax.” Institutions and large organizations become suspect. The hipster directs his ire at the big banks and factory farms, and the miner complains about big government and the liberal media. This makes sense, since pastoralism makes meaning out of experience in ways that are personal, tangible, and local, with claims to knowledge being held sacred. Productivism, conversely, makes meaning out of experience in ways that are impersonal, empirical, and universal, and claims to knowledge are often held as secular and contingent. The productivist might be a Midwestern political science professor, a coder working at a tech startup, or a public health professional. These people live down the street from our hipster and across the holler from our coal miner, but they see their role in the world very differently. They have a sense of purpose about their work that is more instrumental than aesthetic or transcendent. They see problems they want to solve — ignorance (professor), inefficiencies (coder), or disease (public health worker). They seek to quantify their progress — students’ grades or journal citations (professor), A-B tests of user experience (coder), or epidemiological data (public health worker). And they believe the knowledge, coding scripts, and remedies they respectively produce make the world a better place. Once, when I was hunting for funding for a research center at the university where I teach, I met the director of a large nonprofit for lunch. I mentioned that I might try to look to Silicon Valley to find a modest endowment to support the core work of this center in perpetuity. “Don’t look to the tech guys for endowment funding,” he told me. “They don’t believe anything should exist in perpetuity, and they’re not looking at posterity or legacy.” With the right timeline, resources, and ingenuity, no problem is intractable, and no research question is perpetual. This mindset has been called “technological solutionism,” and it is indeed a dominant feature of productivism. Taken to extremes, pastoralism becomes an overly romantic regard for our past, and productivism an overly rationalist anticipation of our future. Pastoralism can be an engine for what we think of as “nationalism” or “populism,” just as productivism can be an engine for what we think of as “cosmopolitanism” or “globalism.” But these groupings are more nuanced than the old ones. After all, we can easily imagine the Brooklyn hipster as a world traveler or the coder at the tech startup espousing some right-wing political views. But these isms blend attitudes toward technology, economics, institutions, faith, and identity in ways that might shed light on mutual misunderstandings. People’s worldviews are shaped by more than a sense of themselves and whether they look to the past or forward to the future. They’re shaped to a large extent by how we relate to others. In general, there are two orientations. People are either so enamored of their own values and beliefs that they want to spread them to others or curious about how other people’s values and beliefs might influence them. Both can be well intentioned, but each has distinctly different consequences. Consider America and its approach to other countries — that is, our foreign policy. But these categories could apply to a population at any level of social cohesion. People who want America to spread abroad its values — democratic politics and free-market economics — could be called “projectionists.” In foreign policy, we’ve often used the term “interventionist” to describe such a perspective. But this term is imprecise because it signals a mere activity, not the organizing principle which undergirds that activity. “Projection” occurs in both space and time — it’s the way something extends itself outward, and also a prediction about the future based on present circumstances. Both these definitions suit American projectionists because they see the appeal of American values as both universal and constant. Similarly, Chinese projectionists seek to export Chinese values, Confucian wisdom, and now “Xi Jinping Thought.” Far from simply projecting military or economic power to serve a specific national interest, this way of relating to others is animated by a missionary zeal and a belief that the world would be a better place if they were just a little more like us. There’s a third definition of projection which makes this moniker for this new ism even more apt. In psychology, we project when we deny our own biases while attributing them to other people. Projectionism is egocentric and becomes, in its extreme form, blind patriotism. Though it makes cosmopolitan claims, paradoxically, it can blind us to important cultural differences. As Yale law professor Amy Chua argues in a new book, American foreign policy is often “spectacularly oblivious to the power of tribal politics” outside its own borders. It’s true there’s more that unites than divides the people of the various nations inhabiting our world, but projectionists have ignored cultural divisions with painful and self-defeating consequences. It’s a wonder the foreign policy establishment remains populated with projectionists — including nation-building neoconservative hawks on the right and democracy-promoting neoliberal interventionists on the left — all seeking to remake the world in America’s image. Prudentialism fits within a realist foreign policy paradigm because it strives to respond to reality and struggles less to create it. It recognizes that there are constraints on America’s influence on others and appreciates how a well-intentioned bias toward action can hurt the people it seeks to help and backfire upon American interests. Prudentialism seeks to perfect democracy at home so that it’s worthy of emulation abroad. But it might see efforts to promote its brand of democracy yielding flimsy results, especially when these results stem from related economic incentives and tacit geopolitical and military threats. As the United States grapples with the aftermath of two of its longest wars, and a president whose outbursts about foreign leaders have been erratic and belligerent, more Americans are starting to see the appeal of a more prudent foreign policy. Delegates arriving at the United Nations begin to comprehend the limits of traditionally projectionist projects. They understand that even people who covet the human rights or intercultural dialogue they champion can resent the need to have a big, foreign, supranational entity championing them. Prudentialism is a stance that seeks to understand other cultures rather than be understood by them. So these delegates meet at a time when there’s a real opportunity to bring a prudentialist perspective to an unlikely place, and to see the world as it is before imagining it as it could be. The sooner we realize that the old framework is broken, the faster we can start to build one that works. Understanding the forces that shape the world — and naming them — is a first step towards managing them. Mark Hannah is a research fellow at the Eurasia Group Foundation and teaches at New York University.